The aging process is complex and there is a high degree of variability in the rate at which an individual ages. Presently, the aging process and its effects in the body are not fully understood. In general, there are some differences in pharmacokinetic and pharmacodynamics effects of medications when comparing younger and older patients. Some of the most important changes that occur with aging are within the liver and kidneys. Although liver function tests such as serum bilirubin, cholesterol, and alkaline phosphatase are not significantly different between older and younger adults, decreased hepatic blood flow, liver mass, and enzymatic activity are seen in many older adults. However, these changes are not necessarily clinically significant and do not take place in all elderly patients. Renal dysfunction requires that some drugs such as methotrexate are dose-adjusted in the elderly patients. Pharmacodynamic changes in older patients may result in an altered sensitivity to drugs as well, resulting in increased adverse events or decreased/increased clinical response. Overall, there are not many clinically important pharmacodynamic changes when examining disease-modifying antirheumatic drugs (DMARDs) or biologic agents used in rheumatoid arthritis. Currently, the available data suggests that conventional DMARDs and biologic agents are similarly effective in the old and the young. Hence, older RA patients should not be excluded from the usual use of these agents to obtain optimal control of disease. 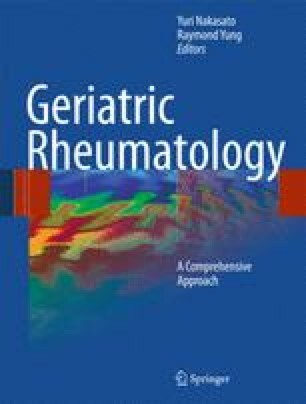 While most studies suggest effective and safe outcomes associated with the use of DMARDs/biologics in the elderly, it is important to keep in mind the possibility of an increased incidence or severity of drug toxicity, particularly among the frail elderly who are an especially vulnerable group of patients. Frail older patients may have poor cardiac, renal, and/or liver function, and a decreased immune function (hence a higher risk for infections). Consequently, their treatment should be approached cautiously, keeping in mind the pharmacokinetic and pharmacodynamic changes that may occur with aging. This chapter briefly reviews the data regarding the use of conventional DMARDs and biologic agents in rheumatoid arthritis patients with an emphasis on their use in older patients where data is available.